At the time of the Cornhill Robbery the weaknesses of safes lay in the fact that the frames of the door opening were insufficiently strong to prevent distortion by the penetration of steel wedges around the leading edge thus creating a gap into which a lever could be inserted - the door plate was usually no more than 1/2" thick which made it relatively easy to enter the pry bar behind this gap and exert the force necessary to burst the screws or bolts attaching the lockcase to the back of the door. For the sake of brevity only the most significant of the 36 patents are described. Of these, Walter Henry Tucker's Patent No.543 is probably the greatest step forward. It states in its third part - 'firmly connecting large lock bolts (lockcase) to door... giving said bolts a tenacity of connection with the doors.' This became standard practice in following years by all makers of thief-resisting quality safes. This can best be illustrated on the drawing of the door of a Ratner Grade 3 which, although made 30 years later, still retains the principal features of the new patent such as solid flange lockcase. In this case 3"x 3"x 3/8"tee-bar has been heavily rivetted front and back to the 1/2" outer door plate with the heavier rivets on the inside plus angle iron of the same size top and bottom. Through the front angle run the main bolts and a 1"x 1" fixed dogging bar is attached to the rear angle to prevent the door being taken out backwards if the pivots are severed. The door edge has now been thickened to 7/8" and the fitting of an internal 3/8" plate to which the bolt tailbar and lock assembly are attached gives a total thickness of steel over the entire door of 7/8." The chamber containing the fire-resisting material fits inside the angles and is held by screws front and back. On this particular safe the entire door surface is drill-resistant as is the lock mounting plate. There is also an automatic anti-explosive relocker fitted above the lock. The following month Samuel Whitfield lodged his patent No.570 for a geared mechanism which screwed the bolts into the body of the safe shown left. Boltwork which operated by round pins engaging through interlocking staples round all four sides of the door was designed and made by James Felton Elwell and was fitted in safes made by Whitfield and badged as the Patent Sicker Safe. 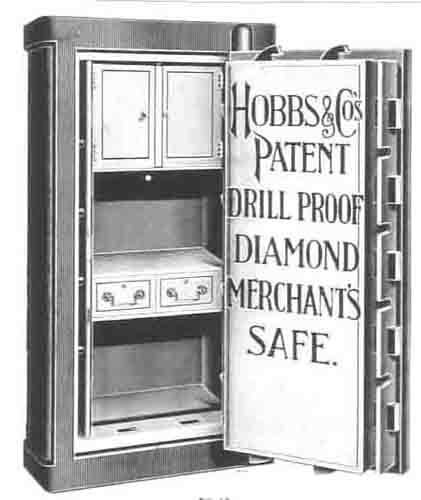 John Methias Hart, a founding partner of the Hobbs Hart Safe Company in 1866 designed a similar type of interlocking boltwork but using flat staples in the door and frame. Milner as was mentioned earlier incorporated in patent No.903 the wedge guard invention of the Manchester Policeman Sutcliffe, while Edward Tann & Son in their patent No.695 fitted grooved and rebated bars around the circumferance of their doors and frames, all conceived to prevent wedges from opening a gap between door and body. Samuel Chatwood by this time had already made significant improvements to body design, having, in 1860, come up with the idea of making two separate bodies, one inside the other, creating a gap into which haematite iron was poured, chilling and hardening on contact with the heavy plates. This was improved upon in his patent No.585 in which he refers to the use of Franklinite and cast steel. His ideas for making his safes more resistant to wedging were the curvilinear door and sliding claw boltwork. The curvilinear design could best be described as a wavy edge to the door with corresponding wave form on the door frame leaving no clear line of penetration for a wedge. Another innovation to body design was in 1866 by R. Noake of Thos.Terry which was described as "wrought iron pillars slotted to take plate edges." A similar idea was also taken up by Tann on their MM Quality and Hobbs Hart in all models from Progress "A" to top grade as illustrated. All this was happening at a time before safe bodies could be made of bent steel and the only methods of reinforcement were by additional heavy iron bands around the front and back of the safe, or by using much thicker iron plates dovetailed on all sides. 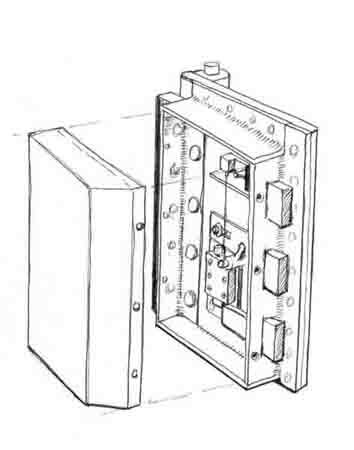 This illustration also shows - at top and bottom only - the claw bolts featured in many of Hobbs Hart safes. Normally they were fitted all round each edge of the door. Chubb offered as an improvement to their best quality safes, a four-way boltwork which could also be made to operate diagonally for greater strength. Drill protection had always been provided to the area in front of the lock since around 1850. This was achieved by the use of hardened steel plates fixed either to the lock face or to the back of the door in front of the lock. These plates to be effective were extremely hard and brittle and could not be relied upon. As part of the Tann patent No.695 was a method of making protective plates which were both resistant to drills but not to impact. This was described as rolling alternate layers of welded steel and iron to form a sandwich of undrillable composite metal. George Price had also patented a similar process back in 1860 which describes 'piling' iron and steel together and rolling. These were usually 1/2" thick. This type of 'hard plate' subsequently came into general use by the likes of both Milner and Ratner for not only lock protection, but also as a protective laminate plate within the structure of the body in the higher grades. It should be remembered that during this period and up until the availabilty of power tools in the 20's, all drilling was done with either the breast-brace or the ratchet drill - a very cumbersome assembly. The safe pictured is a Tann List 2a Quality made in the 1880's. An attempt has been made to cut away the door plate in front of the lock by 'stitch drilling' using a ratchet drill. Although more commonly seen on continental safes, it is unusual to see a British safe fitted with dummy hinges. Scattered on the floor are three breast-braces, a short crowbar, and an assortment of drills. Because most of the early safes were made up of relatively thin plates of iron or steel with a loose sawdust type of filling between, it was not uncommon for attacks to be carried out using large trepanning or tank cutters. These generally required that fixing holes be drilled and tapped on which to mount the assembly. ( à la Rififi ). This was what prompted George Price to offer fully case-hardened doors and bodies on his "Burnley" quality safes. He also offered case-hardening as an extra at 10/- per square foot on other grades of safe, either all over or back and sides only. 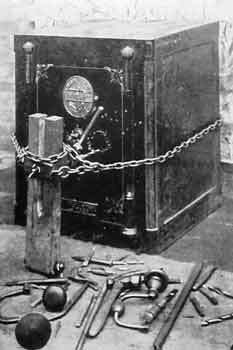 This would have increased the total price of the safe by about 50% which does not seem unreasonable when taking into account the facts that all the plates would have to be pre-worked before the final hardening process took place, then re-rolled and flattened after having become distorted in the converting furnace. A description of the cross-section of such a plate reads - "half-inch case-hardened wrought iron plate the surfaces of which have been converted into steel while the inside of the plate remains unconverted as malleable iron". By the time of the Cornhill Robbery when instances were quoted of safes having been opened by picking and the use of skeleton keys, safe locks had already been designed and were in use which would deter all but the few legitimate locksmiths who specialised in the art. 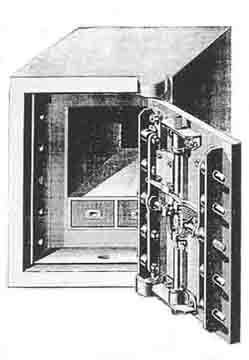 Chubb, Bramah, Price, Tann and Hobbs had each in their own way incorporated within their locks such deterrents as detectors and barrel and curtains which, to all intents and purposes, put an end to the casual safebreaker's ability to apply the technique of picking to the better quality safes of the day. This is not to say however that modern safes have never been opened by picking or false keys. By virtue of the fact that were such to happen, the likelihood is that suspicion would fall first and foremost on the legitmate keyholders. See Author's Notes.